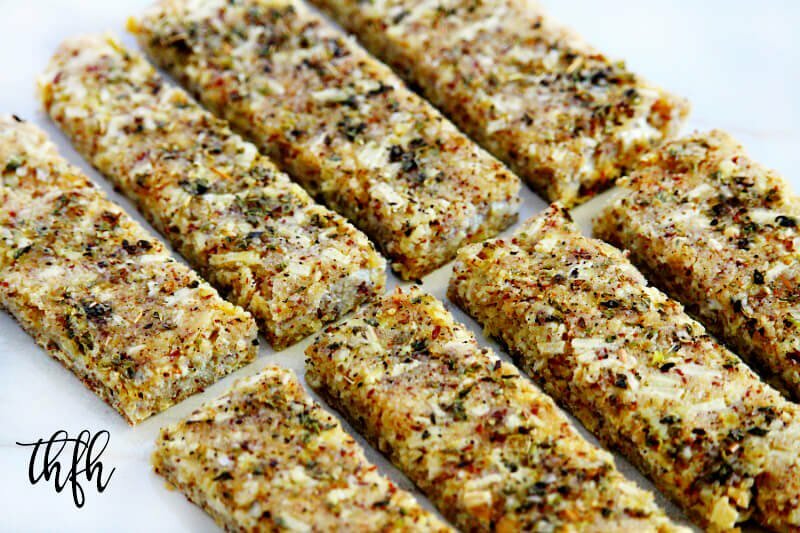 These Gluten-Free Vegan Flourless “Cheesy” Garlic Breadsticks are made with a short ingredient list and are perfect to enjoy by themselves, or with a soup or even a dip. Here’s what’s going on – I’ve got a gluten-free, vegan and flourless “bread” that has vegan Daiya Mozzarella Cheese added in for the “cheesy” part. Then it’s topped with a coating of freshly crushed garlic, extra-virgin olive oil, dried oregano, Himalayan salt and ground black pepper for the “garlic” part. I very rarely use the Daiya cheese because although it’s vegan and has a pretty clean ingredient list, it is processed and I try not to buy processed food if I don’t need to. But I needed to for this recipe and it was definitely worth it for this special treat! The only reason this recipe wouldn’t officially qualify as a “lectin-free” recipe, is because the Daiya cheese has “pea protein” in the ingredient list. I don’t know if it’s a large enough amount to make a difference, but if you have a little flexibility, you can use the Daiya cheese and the rest of the recipe would be lectin-free. If you need it to be 100% lectin-free, you could try Parmigiano-Reggiano (real Parmesan cheese), although I haven’t tested the recipe using it. Or, if you didn’t need it to be vegan, you could try shredded organic mozzarella cheese (also not tested). Ingredients: Breadstick (Wheat Flour with Malted Barley Flour, Water, Breadstick Base (Fermented Wheat Flour, Wheat Flour, Salt, Gums (Arabic, Guar), Dextrose, Mono & Dyglycerides, Cultured Corn Syrup Solids, Soybean Oil, Enzymes, L-Cysteine, Ascorbic Acid), Yeast, High Fructose Corn Syrup, Dehydrated Garlic, Soybean Oil, Mono and Diglycerides, Parsley, Datem, Guar Gum, Sorbic Acid (Preservative), Natural Flavors, Enzymes, Dough Conditioner (L-Cysteine Monohydrochloride), Soy Flour (Soy Flour, Soybean Oil, Soy Lecithin), Garlic Cheese Sauce (Water, Corn Oil, Parmesan and Romano Cheese Blend (Pasteurized Cow’s Milk, Enzyme, Salt), Cider Vinegar, Dehydrated Garlic, Modified Corn Starch, Salt, Parsley, Xantham Gum, Sauce (Tomato Puree [Water, Tomato Paste], Seasoning (Salt, Spices, Sugar, Dehydrated Garlic), Parmesan and Romano Cheese Blend (Pasteurized Cow’s Milk, Enzyme, Salt), Green Bell Peppers, Flavor Blend, (Maltodextrin, Dextrose, Natural Spice Oleoresins), Modified Corn Starch, Corn Oil, Xantham Gum), Imitation Mozzarella Cheese (Water, Soybean Oil, Casein (Milk), Modified Corn Starch, Sodium Aluminum Phosphate, Salt, Lactic Acid, Sodium Citrate, Mono and Diglycerides, Natural and Artificial Flavor, Sodium Phosphates, Sorbic Acid (To Preserve Freshness), Artificial Color). This ingredient list is definitely too long and has too many processed, modified and GMO ingredients. My healthier recipe is vegan, gluten-free, dairy-free, flourless, grain-free, egg-free, lectin-free (with substitutions, see above). 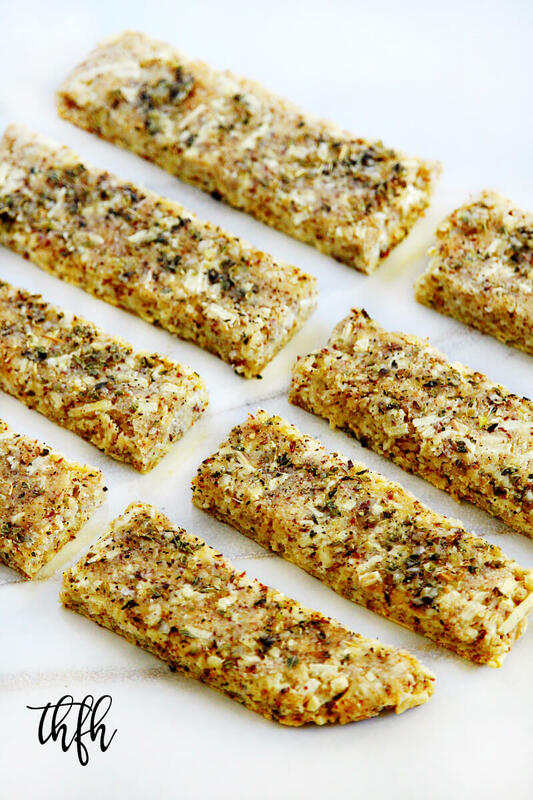 Want more healthy snack ideas? Check out Vegan Cheesy Baked Kale Chips, Raw Corn Chips, Gluten-Free Vegan Thyme and Garlic Crackers or my Clean Eating Cookbook with an entire chapter of 20 healthy, clean eating snack and side dishes just like this one that you will love! Add all the ingredients for the breadsticks to a medium sized bowl and stir until well combined. Transfer the mixture to a baking pan lined with parchment paper. Form the mixture into a ball shape, then using your hands, flatten it out into a square shape approximately 1/2 inch thick and approximately an 8 x 8 square. Bake at 350 degrees for approximately 15-20 minutes, or until it's golden on the top and edges. Remove the oven to add the garlic topping. Add all ingredients for the garlic topping to a small bowl and stir together until well combined. Adjust seasonings to your preference. Pour the topping on top of the bread sticks and spread a thin layer evenly across the top. Use a knife or pizza cutter to cut into breadstick shapes or bite-sized pieces. Best when served warm straight from the oven. 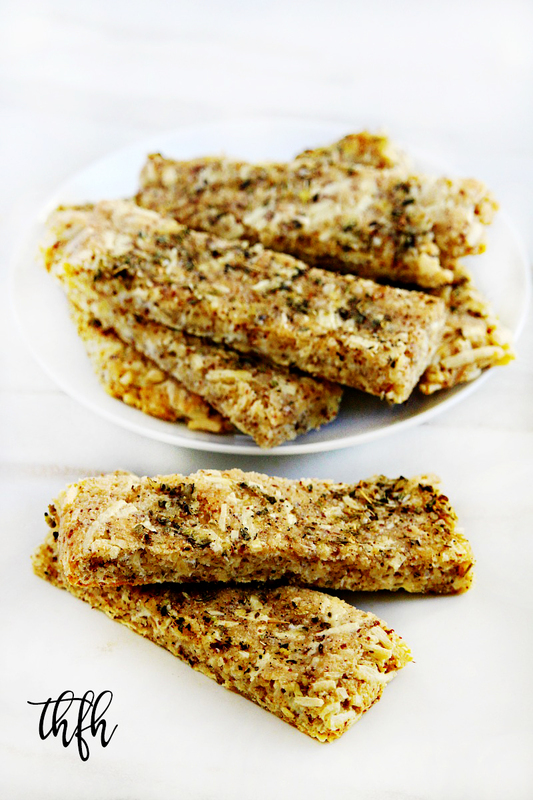 The recipe and photographs for "Gluten-Free Vegan Flourless Cheesy Garlic Breadsticks" by Karielyn Tillman of The Healthy Family and Home website are licensed under a Creative Commons Attribution Non-Commercial No Derivatives 4.0 International License and cannot be used without my written permission. How long will these keep for? I was hoping to make them a few hours before dinner. Hi there Rebecca! They are best when eaten right when they come out of the oven, while they are still warm. If you make them a couple of hours in advance and let them sit, they may be a little “limp” and/or a little “mushy” to the touch, but will still taste good. Made this last night – oh my YUM! I tossed a tbsp of nooch into the topping, well, why not? It was a huge hit even among non-vegan, gluten free company! Hi there Iris! I’m so glad to hear that you (and your guests!) enjoyed the recipe. I agree – you definitely can’t go wrong with extra nutritional yeast lol!